The sociable and sweet-natured little Mi-Ki is an up-and-coming companion toy dog. Weighing somewhere between 4 and 10 pounds, the Mi-Ki is cat-like in agility but all dog when it comes to faithfulness and friendliness. Renowned for his gentle nature, the Mi-Ki is calm, adaptable, and delightfully Gremlin-like (remember Hollywood’s 1984 movie Gremlins?) in appearance. His coat is also low-shedding: a benefit for allergy sufferers and vacuum cleaners alike. An especially recent breed, the history of the Mi-Ki is brief and rather confusing. 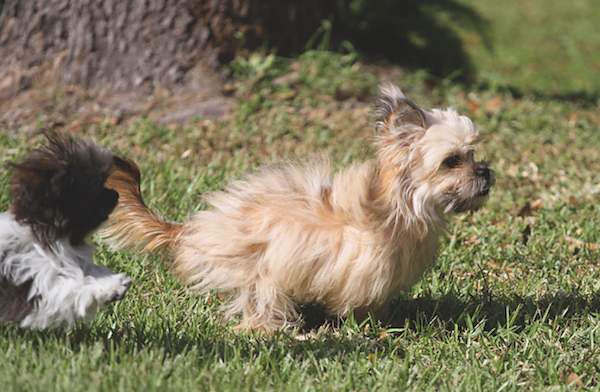 While some details are debated, it’s generally agreed that the breed was established by Maureen Westburg, who crossed several toy breeds in the 1980s to develop the Mi-Ki. She named the breed Mi-Ki because her nickname was Mikkie, or perhaps because the Asian name Mee Kee means “new beginnings.” Anecdotes suggest that Maureen intended to develop an enchanting toy breed resembling a Gremlin, or perhaps an Ewok (it was the 80s, after all). Mi-Ki photos courtesy Carolyn Ausborn and Liz Duke. In her breeding program, Maureen crossed the Maltese, Papillon, and Japanese Chin. The Maltese is one of the oldest companion breeds, renowned for his white, flowing coat and propensity to please royalty. He’s a gentle breed, yet lively, jaunty, and playful. The Papillon, also popular with the aristocracy, was developed in 16th century Europe as an elegant, surprisingly light-footed companion. 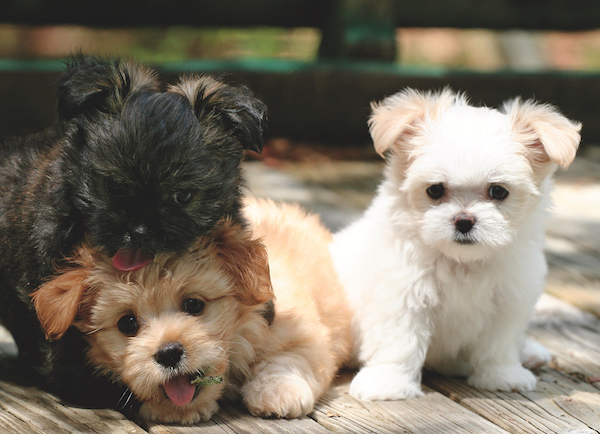 Some groups and registries contend that these three were the only breeds used; others suggest that additional toy breeds, such as the Shih Tzu, may have been included. Along with breed lineage dispute, there’s disagreement about specific physical breed traits. All agree on the breed’s charming temperament, so let’s step aside from debate and focus on living with this delightful breed. Relatively quiet, Mi-Kis generally make nice family companions for those averse to superfluous barking. Some Mi-Ki may alert their families to new happenings, but most are happily horrible guard dogs. A Mi-Ki typically adores making new friends of any species. In fact, the Mi-Ki is generally approachable with other dogs, calm with horses, and agreeable with cats. Agile and sprightly, Mi-Kis may even climb, pounce, and play like their feline friends. Mi-Kis adapt to apartment living with no trouble, as long as they’re walked and included in family fun. With a low to moderate activity requirement, Mi-Kis need exercise and mental stimulation but not strenuous jogs. If you’re looking for an all-day hiking companion, the Mi-Ki isn’t built for arduous activities. Although agreeable and playful with children, Mi-Kis need supervision around youngsters. Given their small stature, they require gentle handling for their own safety. They settle easily into a quiet life with aging adults. Mi-Kis make great travel companions, given their size and enthusiastic personality. “If I happen to move the dog carrier from one room to another, they’ll dance and make circles trying to jump in for the next adventure,” said Carolyn Ausborn of Brooksville, Florida, who shares her life with 9-year-old Enzo and five other delightful Mi-Kis. And celebrating the prospect of travel isn’t the only time Mi-Kis take to the dance floor. “Lexi will turn in circles and then stretch out with her back feet when she’s asked to do the chicken dance.” This cheerful breed will do anything for a smile. School grades: Training a Mi-Ki is rather easy, as they’re positive spirits and eager to please. But if your focus is performance dog sports, remember that Mi-Ki ancestors were celebrated cuddle-pups, not workaholics. Color: All colors, including solid, parti-, or tri-colored. Hair care: The low-shedding Mi-Kis need regular brushing but typically not professional grooming. Special effects: Some Mi-Kis make joyful sounds like a yodel or tweet. Families that share life with a Mi-Ki shouldn’t value solitary time. “I can’t sit and watch TV without my Mi-Kis piling up around me,” said Liz Duke of New Port Richey, Florida. They watch every step she takes, and as soon as she lands somewhere new, so do her Mi-Kis. The Mi-Ki may be rare, but there’s a surplus of organizations working toward standardizing the breed, including the Mi-Ki Club of America, the International Mi-Ki Registry, Continental Mi-Ki Association, and the American Mi-Ki Club. Keep in mind that the Mi-Ki is a new, uncommon breed. Multiple groups of fans (sometimes not all in agreement) are common as a breed develops. And the jury’s still out on many traits that will eventually define the Mi-Ki standard. For now, the American Kennel Club doesn’t recognize the Mi-Ki as a breed. But stay tuned for the exciting development of this delightful new companion. The post Meet the Mi-Ki: This Small Dog Breed Makes a Big Impression appeared first on Dogster.